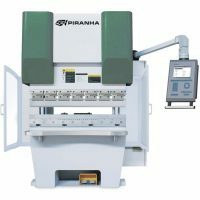 Eliminate hydraulic press brake guesswork and rework with a CNC crowning system that automatically compensates for deflection through hydraulic cylinders in the bed. All you have to do is program your part, the material type, thickness and tools into the Delem controller, and it automatically adjusts the press brake for accuracy. Throw away all your shims and save time and money with advanced EasyCrown CNC press brake crowning technology. Select the desired tonnage range from the tabs above to compare press brake specifications. 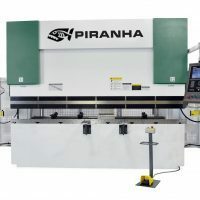 As part of our Perfect Machine Process, every Piranha-Whitney hydraulic press brake is rigorously inspected in our Rockford, Illinois, facility so that it’s ready for seamless installation in your shop. 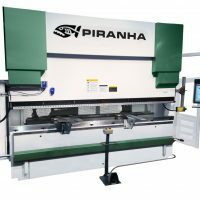 Hear what Michael Dodson of SleepSafe Beds has to say about the performance and quality of Piranha Hydraulic Press Brakes.